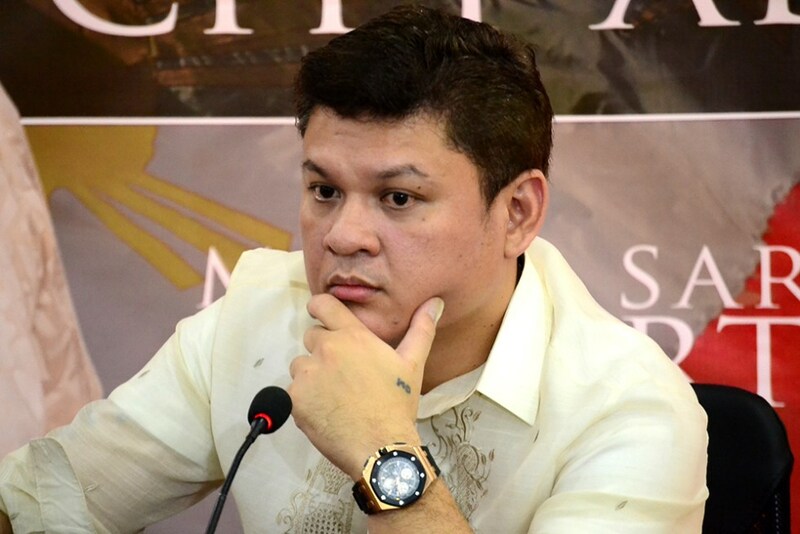 Resigned Davao City Vice Mayor Paolo “Pulong” Duterte, on Friday, unleashes a detailed list of an alleged existing ‘Opposition Network’ seeking to oust President Rodrigo Duterte from office and destabilize the administration. The list includes names of several ‘Yellow’ politicians, Catholic Bishops and alleged church – run companies. 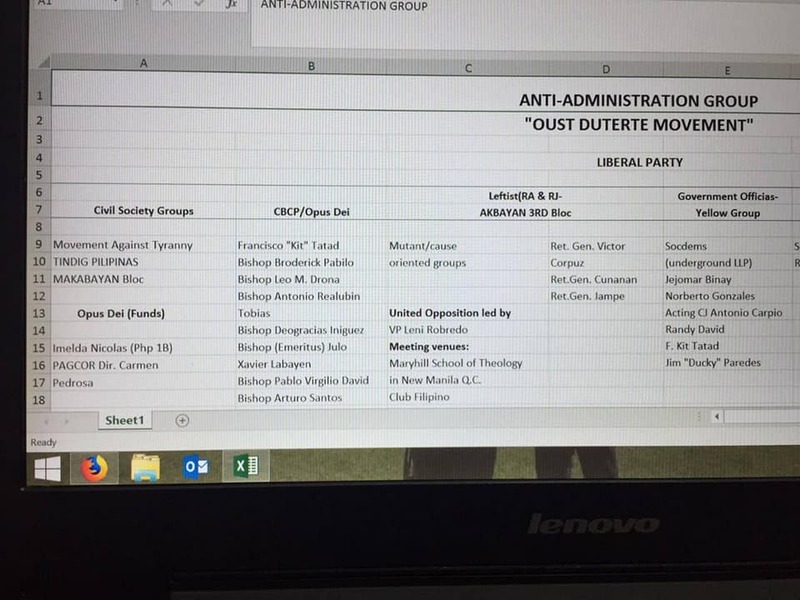 Pulong posted on his Facebook page a copy of the list, entitled “ANTI – ADMINISTRATION GROUP, OUST DUTERTE MOVEMENT”, with a short caption that said, “Gisend ra ni sa akoa ha... Share lang nako kay para bibo...” (This was only given to me, I’d like to share this for FUN). Among those included in the list are Vice President Leni Robredo, former Vice President Jejomar Binay, Senior Associate Justice Antonio Carpio, former Chief Justice Hilario Davide, Associate Justice Marvic Leonen, Senators Leila de Lima and Risa Hontiveros, former Senator Francisco Tatad, and many other officials closely acquainted with former President Noynoy Aquino. Also included were seven Catholic dignitaries such as Bishop Broderick Pabilo, Bishop Leo Drona, Bishop Antonio Tobias, Bishop Deogracias Iñiguez, Bishop Julio Xavier Labayen, Bishop Pablo David and Bishop Arturo Santos. 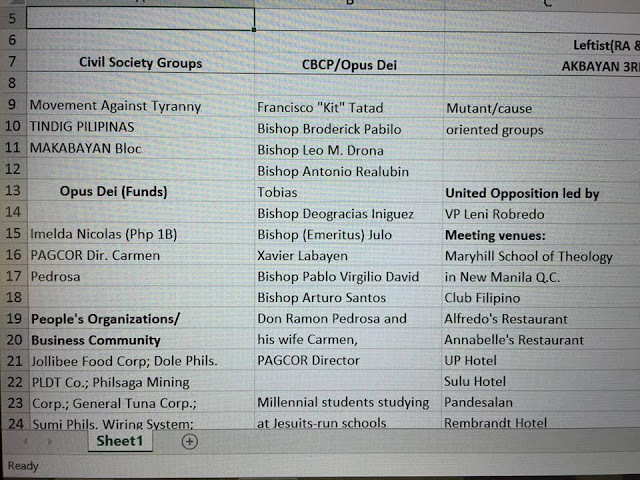 Meanwhile, the companies implicated in the list are Jollibee Foods Corporation, Dole Philippines, PLDT, Philsaga Mining Corp., General Tuna Corp., and Sumi Philipines Wiring System. 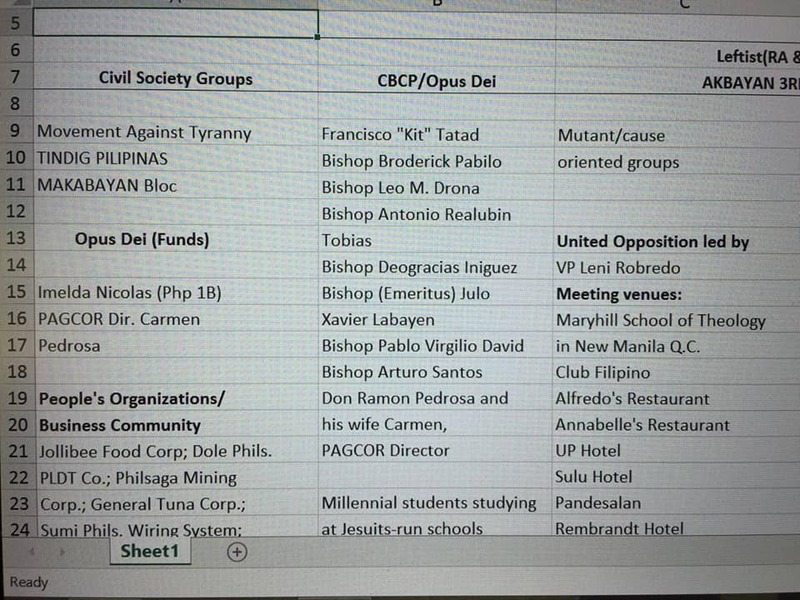 Dragged along the controversy under the “Opus Dei (Funds)” category were Filipino-American businesswoman Imelda Nicholas and PAGCOR director Carmen Pedrosa and her husband Ramon Pedrosa. 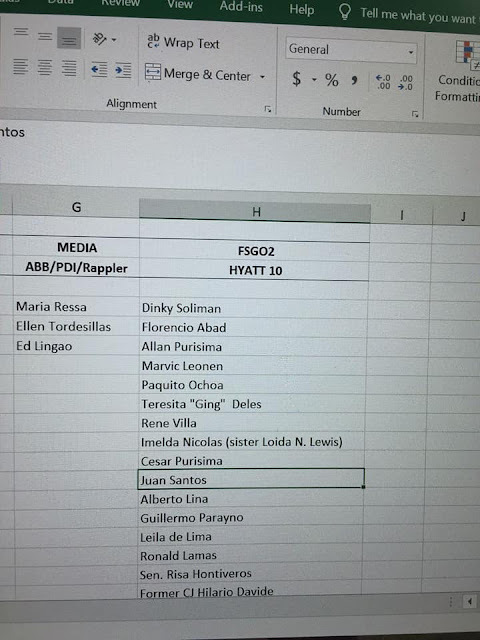 The list goes on including retired military official Victor Corpuz, and retired generals “Cunanan” and “Lampe, columnists Randy David and Ducky Paredes, and journalists Maria Ressa, Ellen Tordesillas, and Ed Lingao. This also includes names of former senior government officials such as former Social Welfare Secretary Dinky Soliman, former Budget Secretary Butch Abad, former police chief Allan Purisima, former Executive Secretary Paquito Ochoa, former agrarian reform Secretary Rene Villa, former anti-poverty commission head Imelda Nicolas, former Finance Secretary Cesar Purisima, former Customs chief Alberto Lina, former Trade Secretary Juan Santos, former Customs commissioner Guillermo Parayno, former political adviser Ronald Lamas. 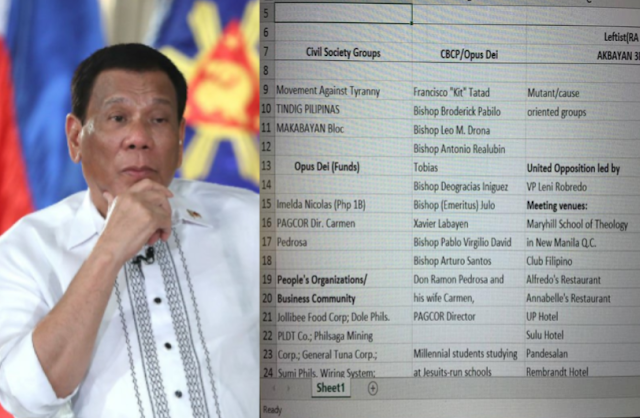 “Millennial students studying at Jesuit-run schools” was also identified along with Movement Against Tyranny, Tindig Pilipinas and Makabayan bloc, and other militant groups linked to the alleged plot to oust President Duterte. Although the communist rebel’s plans to overthrow the Duterte government in a scheme dubbed as ‘Red October’ has fizzled out, Defense officials said the ‘reds’, among others are still plotting destabilization moves for December. Military Spokesperson Brig. General Edgardo Arevalo said authorities managed to spoil the plan by simply baring it before the media in order to discourage legitimate opposition from joining and conniving altogether. The Communist Party of the Philippines (CPP), however, pushes forward its destabilization moves to mark its founding anniversary in December. In a statement in DZMM, Arevalo said, "Ang tinatawag po natin d'yan ay rolling plan. Gusto nilang bigyan ng grandiyosong pagdiriwang ang kanilang ika-50 anibersaryo ngayong Disyembre." "Sumablay man po ang kanilang tinatawag na Red October plan, hindi po ibig sabihin nito ay puwede na tayong mag-relax, put our guard down," Arevalo implied. The General also said that Authorities are now attempting to reach out to universities to ensure that they are not being exploited by the rebels as recruitment grounds for the young. The CPP earlier denied the Red Ouster plot, which was similar to a Maoist rebellion in 1972, which former President Ferdinand Marcos eventually used as justification for declaring Martial Law.